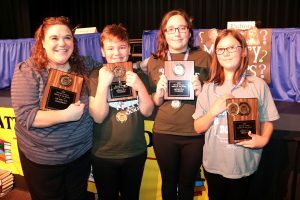 SANDY CREEK – The Oswego County Battle of the Books competition was held on March 12 where teams from all nine school districts in the county vied for the title of champion. The team from the Mexico district was crowned Battle of the Books Champion for Level 1, grade 3-4. Members included: Emma Belfield, Ian Bigelow and Jesse Marthia. The event was hosted this year by the Sandy Creek Central School District. 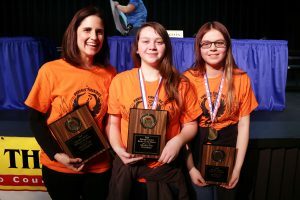 Fulton’s grade 5-6 team took the top spot following two tie breaker questions with the Central Square team. Stephanie Zimmerman coached the team and is pictured witht he champions. Left to right are: Zimmerman, William Wright, Audrey White and Ava Pelky. The teams earn up to eight points for each correct title and author. Points can also be earned for correct title only with no author. Teams are divided into four levels by grade: Level 1: grades 3-4; Level 2: grades 5-6; Level 3: grades 7-8; and Level 4: grades 9-12. 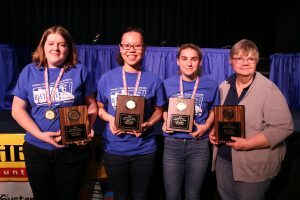 The battles began weeks earlier as teams participated at local levels within their school district for the honor to represent their district at the county level. The Phoenix grade 7-8 team finished on top with Coach Kristy Ryan and team members Harleigh Greenleaf and Lyla Barrow. The battle for champion in Level 1 saw nine teams compete with the team from Mexico taking the top spot. Team members included Emma Belfield, Ian Bigelow and Jesse Marthia. At the close of regular competition in the Level 2 match, two teams were tied for the top spot with Central Square and Fulton moving to a tie breaker round. After two questions, the team from Fulton was the only one to correctly answer the question and was named champion. Team members included Ava Pelky, Audrey White and William Wright. Battle of the Books grade 9-12 level 4 championship title went to the team from Sandy Creek High School. Pictured left to right are: Ashleigh Rosenbaum, Annie Chen, Elsa Graf and Coach Jackie Gregg. Level 3, grades 7-8 saw the Phoenix team leading at half-time and holding onto their lead till the end. Lyla Barrow and Harleigh Greenleaf represented their district at the competition. Level 4, grades 9-12 finished up the competition with the Sandy Creek team victorious following regulation play. Team members Annie Chen, Elsa Graf and Ashleigh Rosenbaum took an early lead and didn’t look back as they earned the top score. 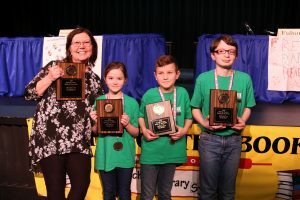 The Oswego County Battle of the Books is coordinated county-wide by the Center for Instruction, Technology & Innovation School Library Systems department.